At this autumn’s first meeting of Akademiska föreningen, winner of the AF Prize in 2016 Anna Klawonn will give a lecture entitled “Depression and negative mood – how the immune system talks to the brain”. Anna Klawonn is working towards her PhD in the Department of Clinical and Experimental Medicine. This autumn’s first meeting of Akademiska föreningen will be a lecture by Anna Klawonn, one of the winners of the AF Prize in 2016. The lecture is open to the public and will be held in English. One of two AF Prizes for 2016, valued SEK 5,000, was awarded to Anna Klawonn, PhD student in the Department of Clinical and Experimental Medicine. 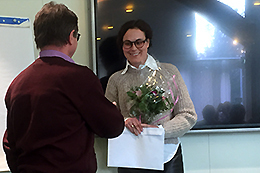 The prize was awarded at Akademiska föreningen’s annual meeting held in Universitetsklubben on 18 April 2017. You have beside your research studies achieved excellent evaluations as a teacher in LiUs experimental biomedical education. Your lecture about motivational circuitry and modern techniques in neuroscience in the master’s level course “Neurobiology” has been the highest-ranking two years in a row. Furthermore, you have in the planning and organizing one of the courses in LiUs 1st International summer school 2016 - “Drug addiction - from genes to behavior”, with enthusiasm and engagement strongly contributed to make the course a success.